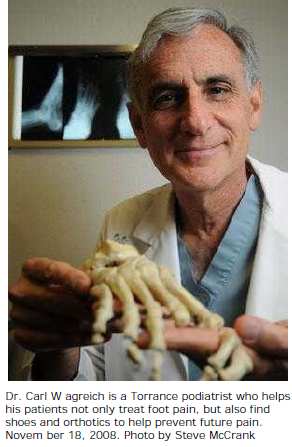 From flat arches to bunions to pinched nerves, Carl Wagreich works to make his patients' feet easier to walk on. A practicing podiatrist since 1979, Wagreich decided on his profession after spending a day with a neighbor who was a foot doctor. Wagreich, 58, earned his degree at the Illinois College of Podiatric Medicine. The Rolling Hills Estates resident also spent the past 20 years working with the Medical Board of California as a consultant, evaluating medical complaints and monitoring podiatrists on probation. Diagnosis and treatment, both medical and surgical, of deformities of the foot and ankle and systemic manifestations of diseases in the lower extremities. What's your personal philosophy on treating patients? My philosophy is as well trained as I am in surgery, to me surgery is always the last resort. For bunion patients, what I'll do is make them an orthotic first. Then I'll get them into the right shoe. About 90 percent of the time, they don't go on to need bunion surgery. There are many causes of foot problems. The foot is an incredible architectural structure. One cause is mechanical instability like high-arched feet. If your feet are out of alignment, it can create problems like hip, knee, back arthritis; pain that shoots down the back; sciatica and bunions. If I can stabilize the feet, the pain goes away. What's another cause of problems? There's the metabolic causes. The feet, for some reason, are an incredible repository of systemic problems. For example, circulatory problems. I'll get a patient with gangrenous toe or an ulcer on the bottom of the foot. The feet have the worst circulation of the body because it's the farthest from the heart. What do you do when you see a new patient? When people come into my office, the first thing we do is give them five pages of medical history to fill out. I have some patients who say, "I just need my toe nails clipped". But I say, "You're not a toe nail. You're a patient with toe nail problems." When people come in, they often have more than one problem. And the problems manifest themselves in the feet. What other causes of problems are there? Neurological problems. They may have ruptured their disc and cut the sciatic nerve and they can't lift their foot. Tell me about your charity work. I've worked with the Baja Project for Crippled Children for almost 30 years. We would go down to Mexicali, Mexico, once a month and see children with horrible deformities like clubbed feet. I've operated probably on about 300 clubbed feet in Mexicali. And we'd train residents there. Because of lack of support and lack of medical residents, we closed our Mexicali clinic in the past year. But we're still helping people in Honduras and El Salvador. Dr. Carl W agreich is a Torrance podiatrist who helps his patients not only treat foot pain, but also find shoes and orthotics to help prevent future pain. To View This Video In High Resolution Click Here.